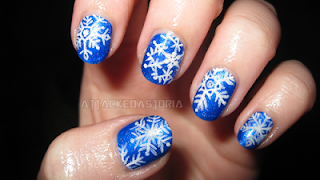 Yes, I know, everyone and their mom does snowflake nails, but they're so easy and fast, and I had no time to do anything fancy for the holidays this year. I'm allowed to be lazy sometimes, okay! China Glaze, Frostbite/silver glitter with white acrylic paint. This is gorgeous, everyone does them but I never get tired of them!